While I was studying abroad in Paris, my roommate inspired me to try my hand at embroidering on knitwear. I had to do a bit of research but it was totally worth it! First I went online to figure out how to embroider knitwear. These sites were the most helpful. The nice part about embroidery is it’s pretty easy to fix any mistakes you make. I’d recommend practicing a little bit so you can get the feel for how loosely or tightly you need to pull your stitches. After I felt confident in my new ability, I went on the hunt for a picture of the thing I wanted to embroider; in this case it was a fox. 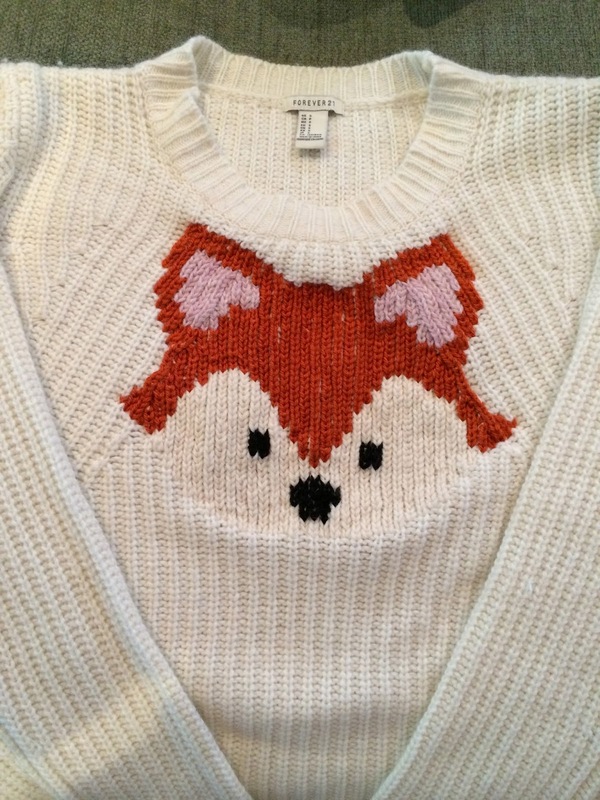 I googled “fox embroidery” and that gave the best results. Originally I tried mapping out my stitches on the computer before putting them on the sweater but I’m a bit impatient and tend to like to just jump into things. I printed out my fox head picture and cut out every colored part. This meant I had a big white piece, a big orange piece, smaller pink pieces and little holes for the eyes and nose. I held up these pieces of paper to the sweater and used them as guidelines so I knew where to make my stitches. Once I did one half, I just mirrored the other and it got easier from there. Unfortunately this craft isn’t necessarily the cheapest. I gave this sweater to my roommate as a gift so I bought a brand new sweater but under other circumstances, I would have gone to Goodwill; they usually have a pretty strong sweater section. Another downside is that you have to buy full balls of yarn and will most likely not end up using all of it. C’est la vie. Hopefully you’ll be able to find other uses for your balls of yarn - I’m going to make another sweater for myself! Bisous mes cheris and happy embroidering. If you're interested in reading more about my crafts, music and book recommendations, and day to day adventures, check out my blog Subtle Witchcraft. I'm glad you liked it so much! I'm also happy to know I'm not the only one who blocks out the designs this way! Brittany has awesome ideas to share so I'm sure you'll enjoy this blog just as much as I do.